They didn’t think much of the first dead whale. Dwarfed by the rugged cliffs of Patagonia’s high green fjords, the team of biologists had sailed into a gulf off the Pacific Ocean searching for the ocean’s smaller animals, the marine invertebrates they were there to inventory. That night, while hunting for an anchorage in a narrow bay, the team spotted a large, dead whale floating on the water’s surface. But for the biologists, death—even of such an enormous animal—didn’t seem so unusual. Not so unusual, that is, until they found the second whale, lying on the beach. And a third. And a fourth. In all, they found seven in that bay alone. Over the next day, they counted a total of 25 dead whales in the fjord. As the team of five researchers from Chile’s Huinay Scientific Field Station sailed south across the Golfo de Penas, the dead were there, too: 200 kilometers away, they found four more whales on the beaches of the exposed, outer coast. At one point, someone’s dog rolled in one of the corpses. The scent of dead whale hung in the boat for weeks. “Everybody was clear about it—this is not normal,” says Vreni Häussermann, director of Huinay station and the leader of the group that made the discovery in April 2015. Häussermann and her team found themselves drawn into a whodunit worthy of a detective show: they’d become accidental witnesses to a mass killing. But what had caused it, and just how many had fallen victim? Sure that it was too much of a coincidence to find two groups of dead whales so far apart, Häussermann and her colleague Carolina Gutstein of the University of Chile went to the National Geographic Society for the funds to run a survey flight. Winter was arriving in Patagonia, and the window for a small plane to fly was shrinking fast. Seizing on two days of good weather in June, Häussermann, Gutstein, and one of Gutstein’s students crammed in next to the pilot and started counting dead whales. By the end of the second day, after bad weather moved in and forced the airsick group to the ground, they knew they had something big on their hands. Häussermann thought they had marked down about 150 whales. It wasn’t until they went through the GPS points that they realized the number was 360. Based on size, shape, and species known to frequent the region, the team posited that at least 343 of the dead were sei whales, the third-largest species of baleen whale and an endangered species. It was the largest baleen whale mortality ever recorded. In a paper published in May 2017, Häussermann, Gutstein, and 10 colleagues from across several disciplines attribute the deaths of these enormous animals, which grow longer than a semi trailer, to something very small: a toxic species of marine alga. Most species of algae are harmless, and are an essential part of the food chain at that. Those that do produce toxins usually do so in small amounts. However, under the right conditions—warm water and a boost of nutrients—algae can grow so explosively that those toxins become a problem, creating what’s called a harmful algal bloom, or HAB. The toxins end up in filter feeders, such as shellfish, which draw algae out of the water, and in the stomachs of zooplankton and other small animals that feed on algae. As larger animals eat these organisms, algal toxins get passed up the food chain. Depending on the algal species, the impacts of toxins on animals will differ: from respiratory distress, to confusion and seizures, to full nervous system paralysis. The further up the food chain toxins accumulate, the more concentrated they become. The largest animals tend to receive the strongest dose, a phenomenon known as biomagnification. Though HABs are familiar fare for marine biologists—having been documented as far back as 1672—whale deaths by algae are not, making the Huinay team’s discovery in 2015 largely unprecedented. Hoping to delve more into the mystery, an international group of seven scientists ventured twice to the Golfo de Penas—in February and May 2016—to gather more information about the role harmful algae had played in the whales’ deaths and to gauge whether such a mass mortality might happen again. With its wide maw open to the Pacific Ocean, the Golfo de Penas—the Gulf of Sorrows—is inaccessible by land and forbidding by sea. The weather in Chilean Patagonia is infamously unpredictable, with tides that can change daily by seven meters and a prevailing westerly wind that makes its exposed coastline one of the most wave-impacted on Earth. On February 1, 2016, after a full day of delays, the scientific team made it at last to Puerto Edén, the gateway to the Golfo de Penas. There they boarded the Saoirse, a private vessel captained by Keri-Lee Pashuk and Greg Landreth. The Huinay field station team had been aboard Saoirse when they first discovered the whales the year before, and Pashuk and Landreth had taken a particular interest in the case of the dead sei whales; over the 10 months after the troubling discovery, they’d chased down much of the funding needed to welcome this new party of scientists. Wending through the gulf’s maze of fjords, the crew of Saoirse found themselves in a land of the dead. Whales stranded the previous year were obvious—stripped clean to bone, or with mummified remnants clinging like shredded canvas to a fluke or a rib—but they weren’t alone: freshly stranded whales had joined them, some only a few weeks gone. The science proceeded smoothly, and the beauty of the region and the novelty of living at sea was a welcome distraction. Yet a sense of unease slowly distilled among the crew. “I feel what I can only explain as a profound sadness, the disassociation of the war photographer having worn thin,” Pashuk wrote on the ship’s blog after two and a half weeks of ferrying scientists to land. That unusually warm water in the Golfo de Penas was a major clue in solving the mystery of the whales’ deaths, and it reflected an event of global magnitude. From January 2015 through June 2016, the planet experienced an El Niño: a period in which easterly winds across the Pacific Ocean weaken, allowing warm water to flow into the space between Oceania and South America. The weather associated with El Niño and its effects are well documented: unusual rainfall in the Peruvian desert, droughts in Indonesia and Australia, and disastrous drops in South American fish populations, to name just a few. Only in the past few decades has another trend emerged: HABs, which seem to coincide with the changes in water temperature and nutrient availability brought on by El Niño. Scientists often trace the rise of HABs back to 1997–98, previously the strongest El Niño year on record. In May of 1998, stranded California sea lions began having seizures on beaches all along central California. After an intensive investigation, researchers discovered the seizures were caused by domoic acid—a neurotoxin produced by a relatively common alga called Pseudo-nitzschia. Both humans and marine mammals exposed to domoic acid can suffer brain lesions, seizures, and memory loss. Scientists think that following the 1998 bloom Pseudo-nitzschia established itself more permanently along the west coast, causing small blooms nearly every spring and summer—and with them, annual sea lion seizures. Widespread ocean warming plays a role in that trend, as does nutrient runoff from human activities. But during warm weather events, like El Niño, the number of sick sea lions tends to skyrocket. When they initially discovered the dead sei whales in 2015, Häussermann and her crew from the Huinay Scientific Field Station hadn’t considered a HAB as the cause of death; they were experts in marine invertebrates, not in whales or HABs. Additionally, there was only one recent precedent for a HAB killing a group of whales: in 1987, 14 humpback whales off Cape Cod, Massachusetts, were killed by the paralyzing algal toxin saxitoxin. Before that, the closest analog seemed to be an ancient one. 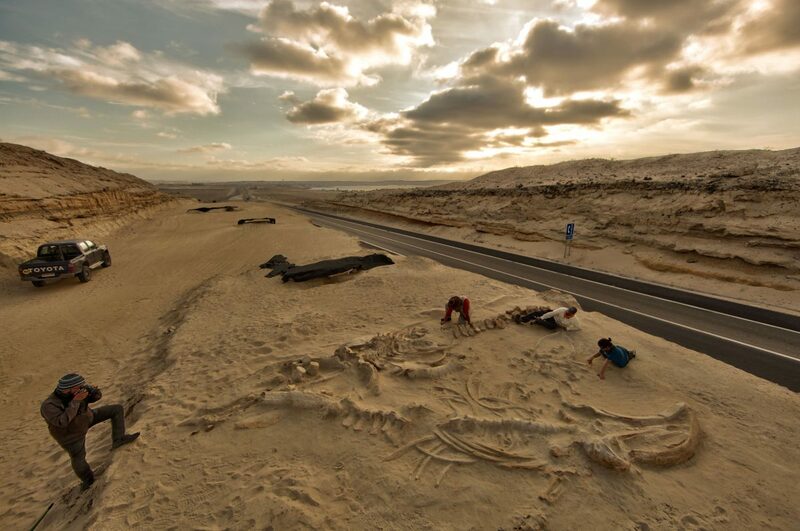 Gutstein had investigated a site in the Atacama Desert, some 2,500 kilometers north of the Golfo de Penas, in which dozens of baleen whales and other large mammals were believed to have been killed by a HAB between six and nine million years ago. But by the time the second group of scientists boarded the Saoirse in 2016, harmful algae were their main suspects. Over the course of the previous year, as samples from the first expedition returned positive results for two different marine toxins, the researchers had watched as effects from El Niño spread across the western hemisphere. “ kind of rewrote what we understand about how these blooms work,” says Raphael Kudela, an algae researcher at the University of California, Santa Cruz. By the end of the summer, the bloom had spread from Santa Barbara in Southern California to Alaska’s Aleutian Islands. The bloom broke all the records: it was the largest, the longest lasting, and the most toxic researchers had ever seen. “There was literally these layers where it looked like straw or something, thick with all these cells,” Kudela says. There were a mix of algal species in the bloom, but it was dominated by Pseudo-nitzschia. In the lab, healthy Pseudo-nitzschia can form chains of 20 to 30 of their golden-brown, needle-shaped cells; according to Kudela, wild chains in the 2015 bloom were 100 to 300 cells long. As the toxin progressed through the ecosystem, Kudela’s lab found it everywhere they looked. The prevailing idea was that after small fish such as anchovies, ate the algal cells, the water-soluble toxin would reside only in their stomachs until it was excreted, usually within 24 hours. But during the 2015 bloom, Kudela’s lab could find domoic acid integrated into anchovy muscle, brains, and gills. At local fish markets, they found it in salmon tissue and in squid, neither of which consume phytoplankton directly. In late May 2015, the Department of Fish and Wildlife in Washington State discovered a sea lion having a seizure on a Washington beach. It had been poisoned by domoic acid—the farthest north algal poisoning had been confirmed in a marine mammal. And soon after, to the far north, along the coast of Alaska, dead whales began appearing, floating offshore. They ran the gamut: humpbacks, fin whales, gray whales, animals so decomposed that they couldn’t be identified; multiple adults and at least one calf. They showed up near Anchorage’s busy port and the remote rocky shores of the Alaska Peninsula, totaling 30 between May and August. Word of six more came from British Columbia down the coast. Unfortunately, many of the whales were too far decomposed to test, or couldn’t be retrieved. The US National Oceanic and Atmospheric Administration (NOAA) said that the summer’s coast-wide HAB was likely involved in the whales’ deaths in Alaska, though the evidence simply wasn’t there to discover. A year later, in May 2016, threads of evidence from throughout the Pacific would start to come together when a landmark paper was published on domoic acid in the region: NOAA researcher Kathi Lefebvre—a member of the team who first made the link between domoic acid and sea lion seizures in 1998—detected the toxin in the tissues of 13 species of marine mammal in Alaska, from sea otters to massive bowhead whales. She had known the algal cells could survive in the chilly north; yet this showed that they had established a significant foothold, one strong enough that it was detectable high up on the food chain. 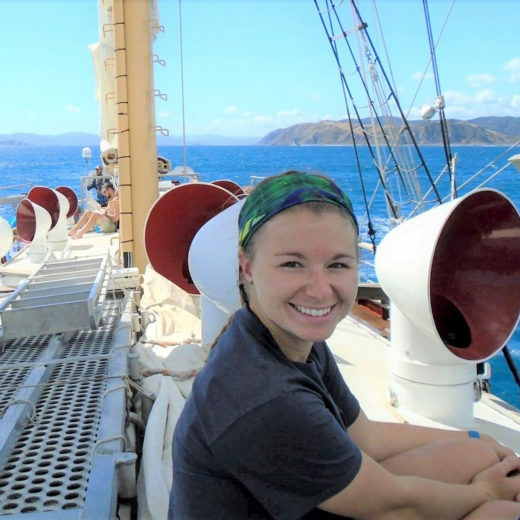 In the late hours of one rainy February night, during the first 2016 expedition to the Golfo de Penas, Saoirse’s captain Keri-Lee Pashuk was woken by a thunk that echoed through the ship’s hull. She lay in the dark, listening as an eerie chorus of whistles and chirps resonated through the water around her. Earlier that evening, Pashuk and the crew had watched a group of killer whales pursuing at least one living sei whale into the fjord where the science team was collecting samples from a young, dead whale. The killer whales were relentless, biting the sei whale and breaching to land on top of it. Peering from the beach through a gathering curtain of rain until darkness fell, the crew watched as the sei whale tried frantically to escape, even if that meant nearly beaching itself. As she lay in the dark, Pashuk had a feeling that the ghostly sounds had something to do with the whales. She was right—when the team rose the next morning, they found a sei whale freshly dead on the beach. As that research trip wrapped in early March, the killer whale attack continued to disturb the crew. They couldn’t say for sure that the attack had anything to do with the stranding, or that killer whales were responsible for the other stranded whales they’d found—but then again, could they say that they hadn’t? This is the problem investigators face with marine mammal strandings: so many factors are in constant interplay, and conclusions often come down to an elaborate process of elimination. Thanks to Gutstein’s expertise in taphonomy—which uses the condition of an animal to infer how it died—the scientists knew that 90 percent of the sei whales had died within a period of months, and they had died at sea: the whales were found lying on their backs or sides, indicating they had been floating, not swimming, when deposited on land. Additionally, ocean current models suggest the bodies came from at least five different locations around the region, meaning that the killer must have been able to affect those individuals across a distance of hundreds of kilometers. Faced with the evidence from their observations and research, the team labored to rule out several potential suspects. Underwater explosions, which can disorient whales and cause them to beach, were one possibility; but that would have left a mark on the whales’ inner ears, which the scientists had found no evidence of. Death by disease, though difficult to disprove, likely would have depleted the whales’ fat as they stopped feeding—but these whales were fat with blubber and had full stomachs at their time of death. And as shocking as the killer whale attacks had been, the researchers learned that most killer whales attack baleen whales to eat their tongues, the easiest organ to access. All of the sei whales they saw up close had tongues intact. Plus, it was near impossible for killer whales to have killed so many whales almost simultaneously. That left only one plausible culprit—a killer alga. Two whales, as well as mussels sampled just after the initial 2015 Patagonia stranding, tested positive for both domoic acid and paralytic shellfish toxin (PST), which can cause muscle paralysis in mammals. 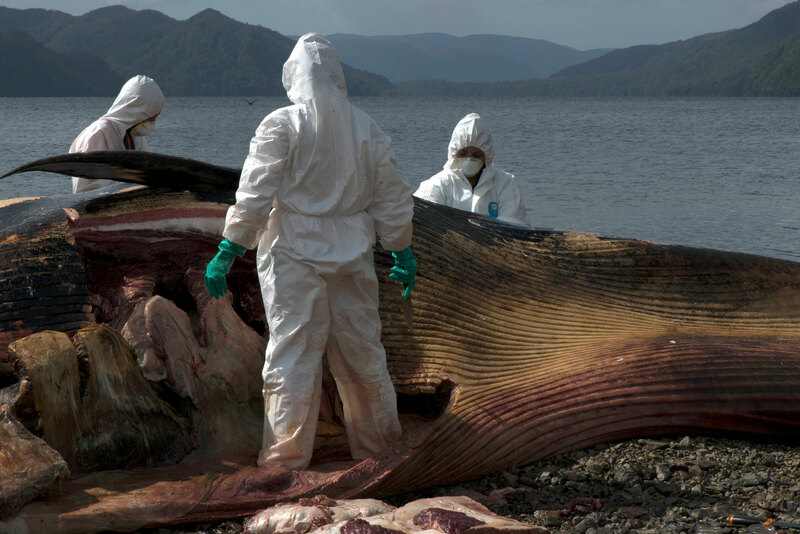 Phytoplankton also tested positive for PST at the mouth of Seno Newman, a long fjord near the Golfo de Penas where 149 of the dead whales were found. HABs that persisted in Chile throughout the investigation carried out from the Saoirse have continued to support this theory, and buoy comparisons to the bloom seen in the northeast Pacific Ocean that was linked to sick sea lions and dead whales. 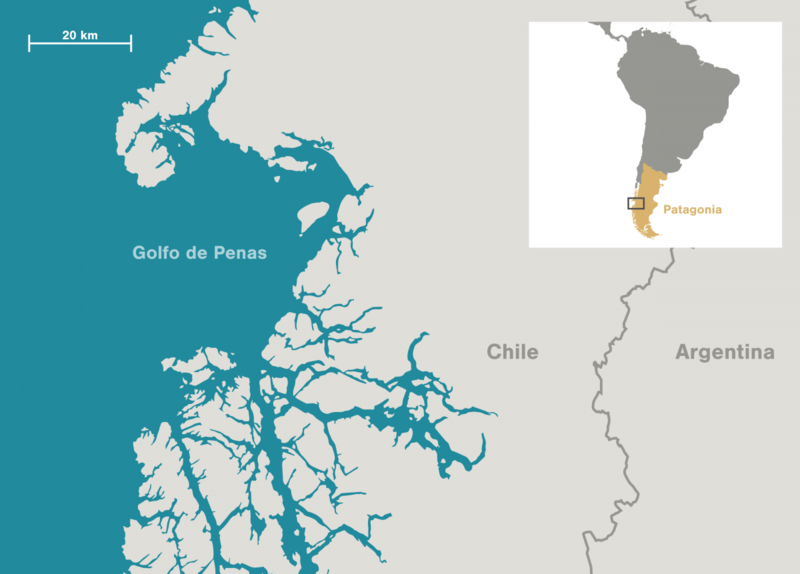 In early February and March 2016, at the same time the scientific team was investigating the Golfo de Penas, a massive bloom was steamrolling northern Patagonia, killing at least 39 million salmon and shuttering shellfish harvests. Chile’s director of National Fisheries and Aquaculture attributed the blooms primarily to the warm waters of El Niño. In January 2017, yet another bloom around the Golfo de Penas killed around 170,000 salmon in farms there. On the opposite coast, harmful algae have also been named as a potential suspect for years of high mortality for southern right whale calves in Argentina. The El Niños most often linked with these HABs are cyclic, infrequent events. Yet years’ worth of dogged work around the world suggests that HABs aren’t just an occasional occurrence; they are increasingly becoming regular events, and are even called the “new normal” for certain areas. On a warming planet, this killer has an accomplice. As the effects of climate change become more apparent, scientists have broadly begun connecting HABs with rising ocean temperatures. Kudela, for instance, found that large blooms off the west coast of North America have been associated with unusually warm water. Published studies have also made this association; a recent modeling study led by scientists at Stony Brook University in New York shows that ocean warming makes expansive areas in the North Atlantic and parts of the North Pacific more conducive to HABs by two species, Alexandrium fundyense and Dinophysis acuminata. However, ocean warming is not uniform, and local climates can greatly impact how an area responds to broader ocean changes. As such, scientists don’t expect the oceans will permanently resemble what the Pacific Ocean saw in 2015–16 any time soon; climate change is not quite so black and white. Yet some research suggests that climate change will make extreme events more extreme, making the fallout of landmark El Niño years like 2015–16 more common. In some areas, this could also lead to an increased frequency of HABs. In the United States, a recent bill approved by the Senate Committee on Commerce, Science, and Transportation would make areas hardest hit by HABs eligible for emergency disaster relief. To advocates of this sort of legislation, HABs—given the havoc they wreak on wildlife, and on the seafoods that humans harvest—are just as much a natural disaster as a hurricane or a tsunami. In this way, the health of marine mammals and humans are knotted together. HABs may signal broad changes happening in our ocean, changes so subtle that humans could easily overlook them. Because marine mammals are usually the first to show noticeable effects, they serve as sentient early warning systems, indicating changes to our food supply and marine ecosystems. Lefebvre was a graduate student in 1998, when Monterey Bay’s sea lions first brought the impact of algal toxins on mammals into the public and scientific eye. The course of that investigation—which, like the sei whale mortality, mystified scientists for weeks—hooked Lefebvre. She was one of the first scientists to suggest domoic acid was behind the sea lion strandings and has since dedicated her career to untangling the effects that algal toxins can have, from the ecosystem level to the individual creature. Some of her most recent research suggests that marine mammal strandings could signal even more insidious threats to humans than we realize. Lefebvre found that chronic, low-level exposures to domoic acid can have long-term effects on the brain. After about six months, mice injected with a low dose of domoic acid once a week showed significant learning deficits and hyperactivity, even though their brains appeared normal beneath a microscope. Though she can’t yet say how these findings translate to human brains, Lefebvre’s biggest worry for human health is algal toxins establishing an unseen presence in communities where seafood has always been a safe resource, particularly where local diets are supplemented with subsistence shellfish harvesting. These communities could be regularly consuming small amounts of these toxins. As warming waters move toward the poles, many remote northern communities are expected to encounter harmful algae—and large blooms—more often. “You can really sort of stress any living system, but you can only stress things until they break,” she says. Lefebvre’s research found that the mice’s brains could recover from the impacts of long-term toxin exposure, but only if they had no exposure to the toxin for at least nine weeks. But larger exposures, even of only a single dose, can have permanent and even fatal effects on both marine mammals and humans. After a HAB near Prince Edward Island, Canada in 1987, 12 of 102 people who became violently ill after eating shellfish experienced short-term memory loss and amnesia for months after the incident. Three of the afflicted died. The past few years have made scientists certain of this: as climate change continues, HABs will be bigger, more toxic, and present in areas they have never been seen before. Yet beyond that, we are sailing on foreign seas—harmful algae could cause subtle, even far-reaching, side effects we’ve not yet discovered. The long-term impact they will have on marine life, from the tiniest of plankton to the largest of mammals, continues to unfold. Here on Earth, we’re all a bit like the science team on the Saoirse, sailing through unfamiliar fjords. We’re on the lookout for something on the surface—but we don’t know what may emerge with the next tide. Cite this Article: Claudia Geib “Death by Killer Algae,” Hakai Magazine, Nov 21, 2017, accessed April 21st, 2019, https://www.hakaimagazine.com/features/death-killer-algae/. 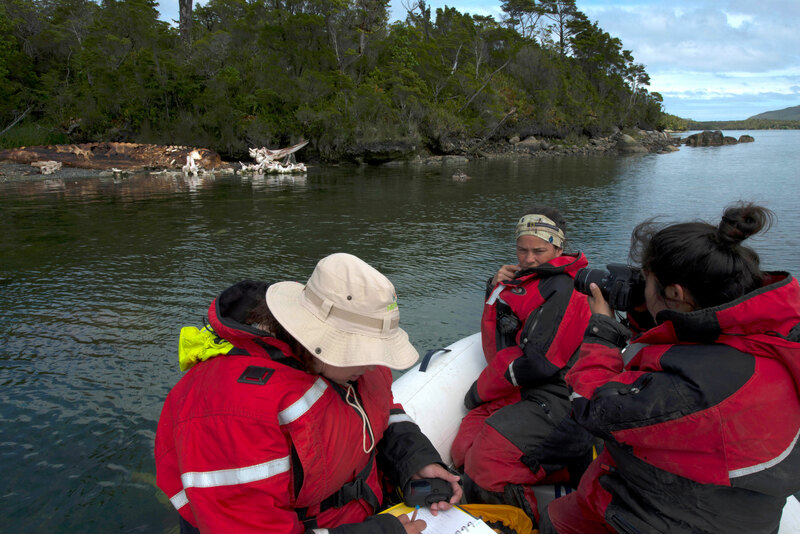 In Chile, a team of volunteers confronts stench and gore to ensure a new life for a dead whale.